Let me say right at the outset of this post that I have hated the idea of KERS in F1 from the moment it was announced. More than for any other of a multitude of reasons, I object to it because it enables the creation of a push-to-pass button (or push-not-to-be-passed button) which seems against the spirit of motor racing. It is like giving a long distance runner a skateboard and telling him that he can use it for 100 yards in every 500 of the race. The argument against that view is that, once all the teams have a KERS system, true competition will be restored as every driver will have access to the magic boost button. This, of course, explains the rush for teams to build, beg or borrow a system as soon as possible; or it would, if there were any such rush taking place. In fact, the only team that seems happy enough with KERS to have used it in every race so far this season is McLaren. 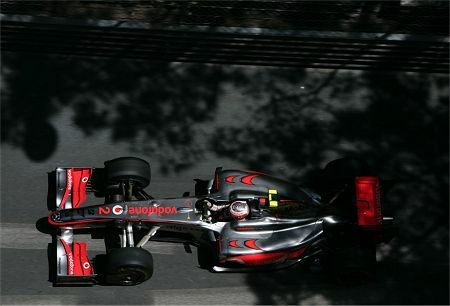 Their system is clearly the best and the team is sure that it improves the performance of the MP4-24. Which should be no surprise since McLaren has long experience of the idea, having introduced it years ago, only to have it banned by Max Mosley. Other teams are obviously not sure that KERS gives any worthwhile benefit at all; their systems appear and disappear from one race to the next as they try to make up their minds. This hybrid device [KERS] is set to revolutionise F1. It will make the sport at once more environmentally friendly, road relevant, and at the cutting edge of future automotive technology. That is what we were first told about KERS, that it was a step towards the "greening" of F1. Yet today all that concerns us is whether it gives a performance advantage or not. Is that not a tacit admission that the technology is not environmentally friendly at all and that its only relevance for the sport is in its potential for giving a competitive edge? Even that debatable point in its favor will disappear when everyone has KERS, as we have already been told. It has become abundantly clear that the introduction of KERS to F1 was a costly mistake that has not delivered on its promises. Whatever benefit it gives at the moment is a long way from justifying the amount of money spent on it and it will become increasingly out of place in the sport as the technology spreads. Has it "revolutionised" the sport? No, it has set F1 on a course of slow and expensive evolution along a path that leads nowhere. Has it made the sport more environmentally friendly? Only if we ignore the extra fuel required to carry its weight around and the difficult problem of disposal of its expensive batteries. In fact, Mosley is so concerned with making his bad idea work that the weight limit has been raised for 2010 to make it easier for the teams to adjust the balance of their cars. More weight requires more fuel to maintain equal performance - or has Mosley somehow managed to alter the laws of physics? Is KERS road relevant and is it at the cutting edge of future automotive technology? Maybe it is but that is not a matter that should be the concern of F1. I have no doubt that Max included this as a sop to the manufacturers currently supporting teams in the sport - the very same teams that he is now trying to force out of F1. And, if the manufacturers leave, they will be replaced by small teams that do not have the budget to develop KERS systems. If KERS remains a part of the regulations or even becomes mandatory, such teams will have to buy in the systems from elsewhere. Which will force Max to introduce a standard system for all, thereby negating the whole idea of developing new technology. We need to face the fact that KERS is an expensive and unnecessary distraction from the business and sport of F1. It may well be a useful interim technology for the car industry as it evolves towards a truly energy efficient future, but it has no sensible application in F1 at all. If the sport is serious in its desire to become more environmentally conscious, it has to consider dumping the dead end street that is gasoline/petroleum-fuelled technology and introducing cleaner fuels instead. I dislike agreeing with Richard Branson but he was right to suggest that the FIA consider his experiments with alternative fuels. Mosley's complete lack of interest is yet more proof that he is not guided by any genuine care for the conservation of this planet. The sad fact is that F1 is still saddled with the curse of KERS because Max cannot bear to admit that he was wrong. Others may be prepared to ignore this elephant in the room but I will not. KERS has no place in the sport and should be outlawed at the end of the season. We've always been in agreement on this one. I still like the problem solving challenge this must have posed to the engineers who developed it, but really-a push to pass button would come in real handy on the freeway, on a racecar it sort of just means the car (or driver) can't do it on it's own. That's just another driver aid by my scorebook. Max's comments didn't really make sense to me at the, but very little he says does. If this was supposed to be the big green hoopla he was trying to sell it as, I always thought that banning refueling and making the cars more efficient would do a lot more in that direction and cut the costs even more by not having to haul those refueling rigs and maintain them all season long. And let's not forget, Max was being very vocal about reducing costs even as he was telling everyone to blow a chunk of cash on a system that requires a warning light be placed on any car that uses it. Well, refueling is finally being put aside, maybe the same logic will prevail for kers. What we need is to get rid of mosley! That's the source of all problems!!! I disagree. The timing is bad because of the cost. I also think the restrictions about how much power per lap is wrong. It should be totally free to use. I agree that refuelling should be banned and the cars should be more efficient and of course, Max out. BTW according to N. Kiesa on Danish TV then should Ferrari and McLaren in Monaco adjusted the KERS and engine electronics to save fuel because no speed advantage was possible. The weight increase will make no difference as the excess weight will be used up in building a bigger fuel tank and all that that requires. It is certainly not going to help the bigger drivers. Of course there is a plan to reduce the width of th front tyres next year so that will make a big difference. KERS. Bad idea badly executed. No point saying any more. Kiesa is talking rubbish. The McLarens were using KERS through the tunnel where an extra 80 bhp gives a big time afvantage. I didn't see any on board going up the hill from St Devote to Casino Square but KERS must buy some time there too. I think Hamilton's quali accident was KERS induced. Frequently during Thursday and Saturday the rear end of the KERS cars was stepping out in the braking zone prior to the turn in. I guess KERS is not stable over the bumps. I can't understand the pioneering technology argument either, trains have used similar devices for years. Clive, I can just see your face as you were agreeing with Branson ! Like eating a lemon ! There are many, many things that F1 could - and should - do to improve its green credentials. Of course I am preaching to the converted here anyway so I won't detail them. But I am in total agreeance that the very best thing F1 could do for the environment is to vote S&Max out ! Why bother outlawing the KERS? If the system was not sufficient enough, teams will drop it themselves automatically. Maybe someday a talented engineer will pop up a genius idea that could gave a car significant advantage and save the world at the same time, doesn't that good? Hezla: Fair enough, you are certainly correct that timing of KERS' introduction was bad and that the limits were set wrongly. The value of KERS to F1 is a long argument and I don't really want to expand on what I have already said; suffice to say that it is an additional expense that the sport really does not need at the moment. At least we are agreed on the main issue - Max out! Steven: The matter of what caused Hamilton's accident in qualifying is very interesting. The car actually went sideways as it rounded the bump on the run down to Mirabeau - I thought at the time that was strange, never having seen that happen there before. From that moment, Lewis was fighting the car for control and that is why he got the corner wrong, slid out and made contact with the barriers. Your explanation regarding KERS strikes me as being the most likely initial cause of the whole thing. With the car going light as well as changing direction around the bump, any application of extra power was bound to risk the rear tyres losing traction with a tail slide the inevitable result. Note that other KERS users wait until the car is travelling in a straight line before unleashing KERS power. It would be just like Hamilton to try for that little bit extra by feeding it in at that point of the circuit! The man is just brimming with confidence, even after all he has been through. Richard: And KERS was already on a few production cars when Max thought of it. How is that F1 introducing new technology? David: A good argument and one that is gaining ground as the teams struggle to make KERS worth the trouble it has given them. The problem is that Max can make it mandatory at any time and then the sport is saddled with KERS, like it or not. Even if you feel that KERS is a useful contribution to cleaning up the planet (and I don't, since its main function is to make gas/petrol engines a little less dirty but can never replace them), it can only achieve that in the area of everyday motoring. In F1 it will always be used as a way to get more power and so cancel out any environmental benefit it might have. One day F1 engineers may make genuine contributions to the conservationist cause but they will be in the area of designing new engines that do not use fossil fuels. Steven Roy: You might be right and Kiesa wrong. I don't know. His explanation was that they still use the button and get the extra 80 hp from the KERS but at the same time the electronics reduce the engine power to save fuel. If there is any truth in Kiesas words then it would be a setting they can switch between and Hamilton could then easily chose the extra power in qualifying and perhabs the save fuel setting in the race when you are behind slower cars. I have been baffled by the KERS intoduction right from the start. Hybrid cars are a great solution to city, stop start travel as the fact that electric motors do not use any energy while stationary and are very efficient through the acceleration stage make for big fuel savings. However apart from going all electric I am convinced that the best way forward is to make the internal combustion engine more efficient, Honda, BMW etc have already made great strides in this area but F1 could certainly make a big difference to this technology. All they need to do is restrict the amount of fuel available to the cars and then free up engine development and restrictions. Then the engineers can come up with efficient engines. Also if an engineer can make a 5 litre engine more efficient than a 2 litre engine then let them. Then each year the avaliable fuel could be reduced in order to keep pushing the engineers. Another great solution to produce a more green F1 wopuld be to make the cars partly out of recycled (and recyclable) materials. A UK university made a GP3 (i think) car out of food! (The stearing wheel was made out of material extracted from carrots and the body work was also made out of plant fibre. Steven -you´re right. Felipe Massa said after the qualifying that he used KERS at three points in Monaco: in the box straight; in the short straight Just after the Saint Devote going to Cassino and in the tunnel. Hm ... I think quite the opposite. Watching Top Gear's Clarkson mouth off about ... the necessity of slow cars forces me to wonder if this guy is missing the point and vigorously ignoring the signs of time. KERS as a MAX'im tool has its usefulness. It speaks to all of us from a global platform like no other that F1 or any other motor sport for that matter can and will not last as is. It pushes business changes frame of mind and helps car makers place ads on their so far worthless (GM' 40 mile Volt) cars. I look at KERS solely in terms of a larger than life billboard pointing out external necessities - like say - mother earth. KERS in my view helps all be it on a different subject matter. So it has no use in F1 and equilibrium once in effect will render it a complete waste of time resources and money but by then we will have understood the actual message and love it for the child we never wanted. F1 is a show first and foremost - there are so many worthless innovations going on in areas tv has not yet poked a camera into and as such the actual thought the idea behind KERS is right there where it belongs. Now this Virgin of a Branson makes helluva lot of noise over his bio-diesel 747 BUT I say burning food for fuel is an insult to life! mastering hydrogen - electricity even - now that's the way to go - BUT who could earn off of producing hot air? I thought KERS can only be implemented when the car reaches 100 Km/h was Hamilton that fast or am I mistaken on that fact? Lee: I have doubts about reducing the fuel available to the teams to encourage research into more efficient engines. It sounds right but, when tried in practice, often results in the racing suffering as drivers rein in the cars to make it to the finish line. And F1 is first and foremost about racing! Michael: I agree with most of what you say. Certainly, we have all become much more aware of KERS thanks to its introduction into F1. And bio-fuels are a truly terrible thing while they are based upon food products. There is some hope in its production from algae, although there is still the problem of arable land being diverted to fuel production rather than food. It is true that KERS can only be used over 100 kph. The part of the circuit that we are discussing is a pretty fast one, however, and we can be sure that the cars were reaching well over that speed at the spot where Hamilton started sliding. "I say burning food for fuel is an insult to life!" You don't believe that fuel is some sort of magical totally mineral stuff do you? We burn forests for fuel too, all the fossil resources were ultimately living things (or processed by living things). Humanity has survived all this time by using the rests of animasl and plants. Ok, but that's for another blog, the main thing here is Max out! Oh, and Clive, algae are food to. funny you should mention what we humans so naturally do. I was thinking exactly that when I wrote my comments yet I decided that the KERS-message of "earth first" or "life first" was more important. Haplo, your comment seems to prove my point the more. Burning food for fuel is in all totality wrong and KERS is a billboard a signal for me ...... and for you. I somehow don't see MAX leaving any time soon. He has built a system of dependency around him. Far too many important people major clubs like the automotive club of Nigeria owe him a big thank you - like for the 100 million dollars plus change in form of drivers super license price-hike. In traffic when it is not possible to go faster than the car in front I am sure that KERS would be used to save fuel rather than gain performance. When there was no car in front it was used to gain time. I think we are in total agreement we just expressed our views in an unclear way. With Hamilton's accident I was talking about the braking/charging phase of KERS rather than the power on phase. In braking some of the slowing is due to conventional brakes and some is due to power bering consumed by the KERS motor/generator unit. I think somewhere in there a lot of problems occurred in Monaco maybe due to the bumpy nature of the track. From FP1 on Thursday morning I noticed that the rear of some cars were strpping out well before the turn in and in a place where there would never normally be any incident. After a few such incidents it was quite clear it was the KERS cars that were doing this. Theye were not just doing it at Mirabeau but at various braking points rounf the track. great explanation and Thank you very much for that Steven. Now all of it actually makes more sense to me.